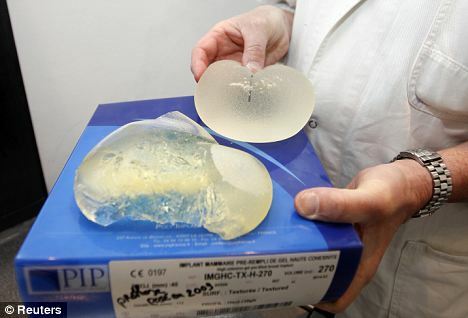 In January 2012, authorities found that French breast implant manufacturer PIP used industrial grade silicone (illegal) instead of the medical grade silicone that is approved for breast implant use. The findings came after about 1,000 women in France and Europe experienced implant ruptures, placing their implant failure rate several times higher than what is normal. Officials believe that between 30,000 to 50,000 women throughout Europe may have received these PIP silicone breast implants. Women who received silicone breast implants in the United States do NOT have a chance of having received these implants, as PIP has never distributed implants in the USA. European women who have received silicone implants from manufacturers aside from PIP are also not affected. First, confirm what kind of implant you have with your surgeon if you don’t already know. To be on the safe side, several medical agencies in European countries (including France and the U.K.) are recommending that women have PIP silicone implants removed as a precaution, even if you show or feel no symptoms of a rupture. Ruptures are often silent, and are not always detected on imaging software. Please see further below for a special message to U.K. women. Know exactly what manufacturer your breast implants are coming from before you get a breast augmentation. Ask your surgeon for all implant details – manufacturer, fill type, and cc amount. This information should never be a mystery or surprise to you. Doing your homework helps keep you safe. Only hire a board-certified plastic surgeon, whose first priority is patient safety, and who will only work with a manufacturer who has passed all testing and safety requirements. Mentor Corporation and Allergan are two of the most trusted breast implant brands in the industry. If your surgeon recommends a different brand, do your Google research and consult with the aesthetic governing agency of your country if need be to double check that the breast implants are from a reputable company. “Authoritative new professional and patient guidance for all women who have received a PIP breast implant has been released today (Tuesday, 17 Jan 2012) by the professional bodies representing surgeons. The new guidance provides patients with practical advice on what to expect and their rights, indicates to GPs where to refer different groups of patient and advises surgeons on treatment. The guidance goes beyond current government advice aimed at patients with symptoms to give additional practical advice for the majority of patients who do not. – All patients should be able to have an assessment by a surgeon regardless of whether they have symptoms. – If a patient requests removal – they should expect to get this, regardless of the presence of any symptoms. If a patient wants time to make up their minds this should be respected – surgery to remove implants must not be a time-limited “take it or leave it” offer. – Scans should only be used as a tool to assist patients make a decision and only take place after the patient has had a consultation with a surgeon. Scanning alone is not a reliable enough tool for detecting failure rates in breast implants. – Reaffirms the surgical association’s view that all clinics have an ethical and moral duty of care to offer these patients treatment without charge. – Advice to GPs on where to refer patients with different symptoms to ensure they get most appropriate treatment. This is why it is important to talk to your surgeon about all the details about the procedure well before the actual operation is to take place. Also, it is best to do a background check on your choice of clinic to make sure that the office is of good repute. You can also ask for recommendations from people who have had a successful surgery before. I strongly agree with you, Gilda! For safety purposes, anyone who wants to undergo breast implants should be aware of all the dos’ and don’ts before having that procedure. Plus, they should make sure to go for a reputable and well-esteemed clinic.